The first in a continuing series at AMMP about Australian music history from AC/DC to Zoot. A is for AC/DC. 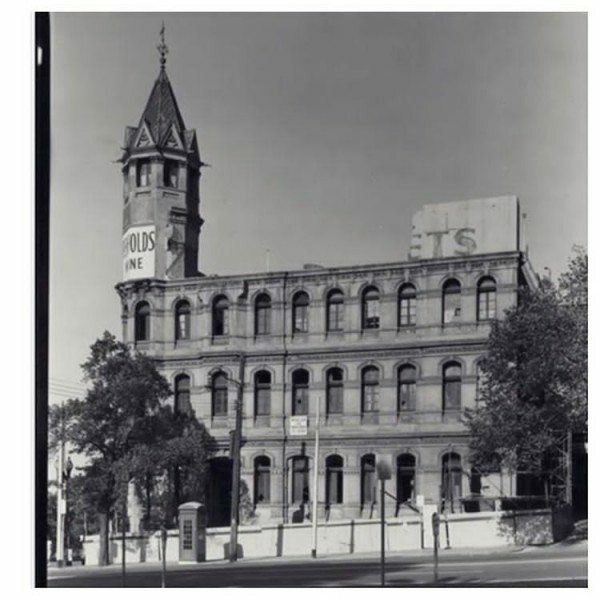 The story of AC/DC begins in the Sixties with a club called Victoria and Albert – also known as Bertie’s – at 1 Spring Street, Melbourne. Speaking to AMMP from his home on Sydney’s Northern Beaches, former manager Michael Browning can remember everything – even the hot dogs. 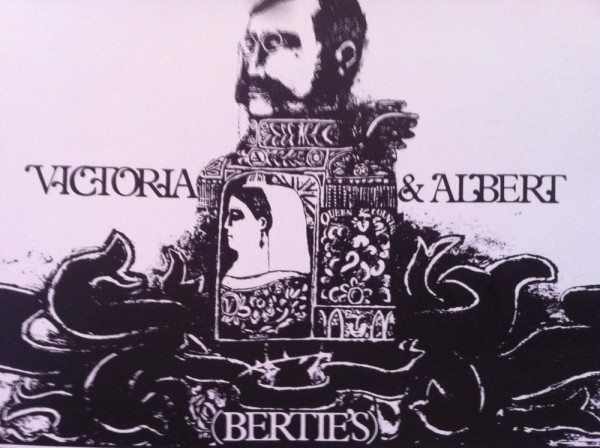 Victoria and Albert, which Australians immediately rechristened Bertie’s, in inner-city Melbourne was heavily influenced by swinging London. This was the puffy shirt era of music and Bon Scott was there. (Incense and peppermints not pictured). Bon Scott in The Valentines. Puffy shirt alert. 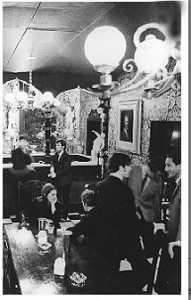 Victoria and Albert (Bertie’s) in Sixties Melbourne. It may not look like it, but Bertie’s was also where Billy Thorpe and the Aztecs would rock the room. Michael Browning would famously then adopt Bon Scott, Angus Young and recreate AC/DC – first removing their watches. Hang on a minute. “Yeah, that’s true, I didn’t want them to wear watches,” Browning confirms. It didn’t tally with the star power he wanted for the band. He wouldn’t let them catch trains or trams either, for the same reason. After all – Mick Jagger wouldn’t have been seen on the number 96, would he? Details like this make Browning’s book a must for true AC/DC fans, but also for anyone curious about Melbourne’s rich music history. 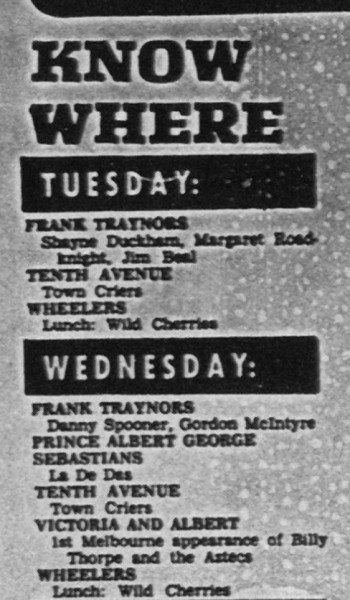 This is an advertisement for Bertie’s from April 24th, 1968. Michael Browning’s Bertie’s in 1968. Dog Eat Dog is the bible of all the AC/DC biographies because not only was Michael Browning there – he can also remember it. In May 1975, for example, he was juggling not only Billy Thorpe and the Aztecs late on Saturday nights, but AC/DC every day of the week, Monday to Friday, from 1.00pm to 3.00pm. Yes, you read that correctly. Afternoon weekday gigs. With hot dogs. One fan of The Hard Rock Cafe, writing in a forum at The Age remembers Billy Thorpe and the Aztecs in the basement of Bertie’s around 1970. The gear? Vox AC30’s and column PA’s with 4.12 inch speakers per side. One transit van. One roadie. No hearing left. This was the start of what would become Australia’s golden age of pub rock, partly thanks to Michael’s vision. 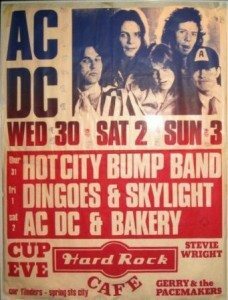 At The Hard Rock Cafe at 1 Spring Street (corner of Spring and Flinders Street, where there now stands a typical Melbourne high-rise office block) you could have seen AC/DC, Split Enz, Daddy Cool, Richard Clapton and Lobby Loyd and Coloured Balls – all in one month. Running Bertie’s with Andrew Knight (born into one of the city’s wealthiest families) Browning would see the venue through from Sixties whimsy to Seventies hard rock. Hard Rock Cafe Gay Night – and AC/DC. AC/DC at the Hard Rock Cafe. Bakery were the support. The door entry price at The Hard Rock Cafe for AC/DC’s launch of High Voltage and Baby Please Don’t Go in February 1975 was one dollar. One Australian dollar. Just for the record, in 2009, two of Bon Scott’s surviving notebooks went for US$35,00/AUD$44,000 at auction. If you happen to find an AC/DC ticket stub from 1975, you can now sell it for AUD$1400. 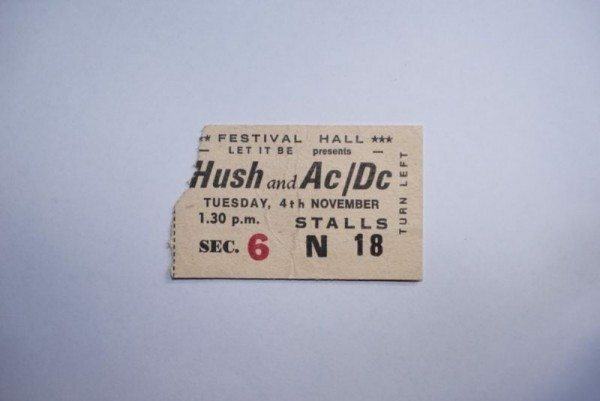 1975 ticket for AC/DC and Hush – priced at $1400. 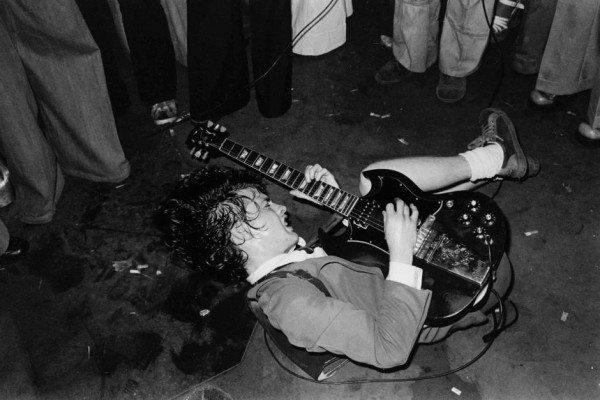 Angus Young at the Hard Rock Cafe. Andrew Wittner. Powerhouse Museum Sydney. This fantastic photograph of Angus at The Hard Rock Cafe in 1974 with one of AC/DC’s legion of Melbourne female fans (her name was Vanda) shows her home-made band logo, applied to her shirt with a sewing machine – and a shark’s tooth necklace, a big mid-Seventies fashion in Australia. From Crow’s Garage. The marketing for AC/DC would be directed at a male audience, not long after this photograph was taken in Melbourne, at 1 Spring Street. 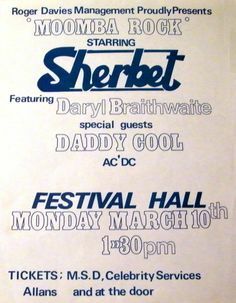 In the mid-Seventies, AC/DC was still finding its feet, which is why we find them billed with Australia’s most successful boy-band of the era, Sherbet, on this poster. Note the running order. Sherbet. Then Daddy Cool. Then AC/DC. 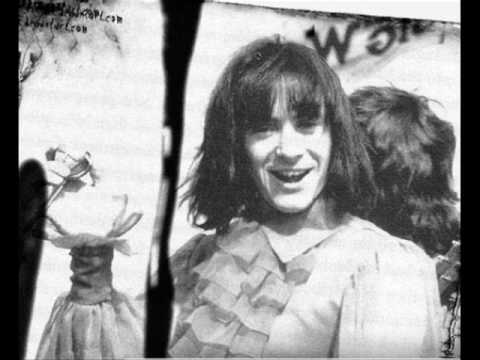 Anyone who still thinks Oasis invented Lad Rock never saw these photographs of Michael Browning with AC/DC (Allen & Unwin). Pictured: AC/DC receive billing below Sherbet and Daddy Cool at Festival Hall, Melbourne. 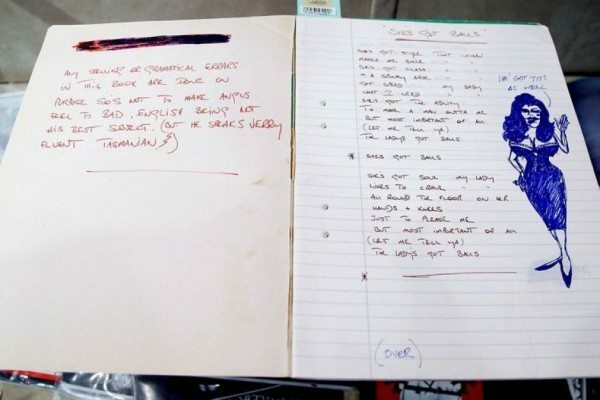 Bon Scott’s notebooks. Bon Scott’s leather jacket (at The Australian Music Vault, Melbourne). 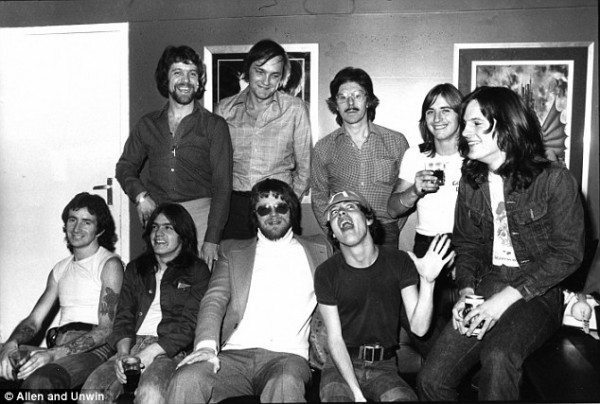 Former AC/DC manager Michael Browning with the band – from Dog Eat Dog (Allen and Unwin). Curator at The Australian Music Vault with Bon’s jacket. The Hard Rock Cafe today at 1 Spring Street is a memory. Only AC/DC Lane, a walk away – and Cherry Bar, down the end of AC/DC Lane – hold the sacred space. 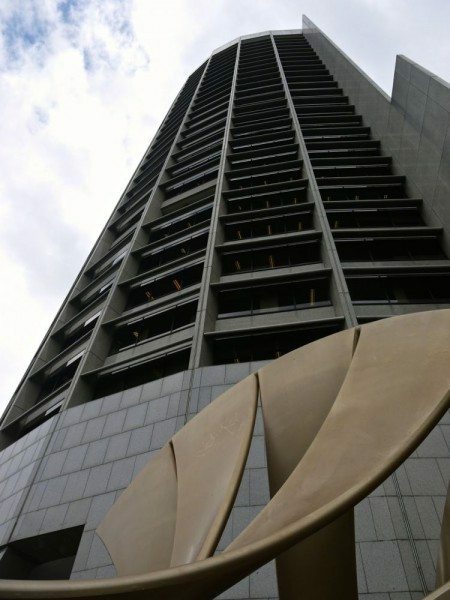 The Shell building (below) stands where Angus invented his ‘dying insect’ routine. I agree that Goddess Media may collect this information for the purpose of sending me occasional newsletters from AMMP. Photograph your Australian music memories – badges, posters, magazines, album covers, t-shirts and send them in. Casettes break. Paper fades. T-shirts fall apart. We need to know what remains. And tell us where and when you saved the memory, if you can. Submit your photo below. You can send multiple files at the same time. Max file size: 5MB. 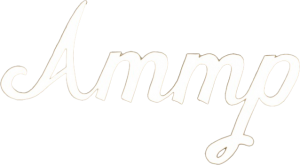 I agree that Goddess Media may collect and publish my photo(s) on the Australian Music Museum Project, and contact me in regards to my submission from AMMP.